Hey DFV kids, Felipe here filling for Sassy Steffi as she pulls yet another late nighter workin’ for the man while I hold down the homestead. Way back in 2005, when we made the switch to me being the homebody, my cooking skills were pretty limited. Not vegan cooking skills, but cooking skills in general. It became obvious pretty quickly that my limited repertoire wasn’t going to cut it in the long haul and that I needed some help getting up to speed quickly. Enter the cookbooks “How It All Vegan” and “The Garden of Vegan” by Tanya Barnard & Sarah Kramer and Sarah’s solo project “La Dolce Vegan”. For some reason I was drawn to these books, and I used them as a launch pad for my vegan cooking. More than a few of the dishes I claim as my own began from a seed I gleaned from these books, then modified, enhanced and tuned for the DFV palate. However, until this past day there was one recipe that I have never Felipe-i-fied, “Wolffie’s BLT Brunch Casserole”(W-BLT-BC). It can be found on page 43 of La Dolce Vegan. It was one of Stef’s favorites the way it was and who am I to mess with something that already was working for her? It’s Vegan Mofo and I’m supposed to work with what’s around the house, and looking around I had most of the ingredients needed to whip up a batch of W-BLT-BC plus a couple of extras I finally decided to add to the mix. I didn’t veer to far from the script, sautéing some white onion (I didn’t have the green ones the book calls for), red bell pepper and a jalapeño before adding in the tofu and spices according to recipe. 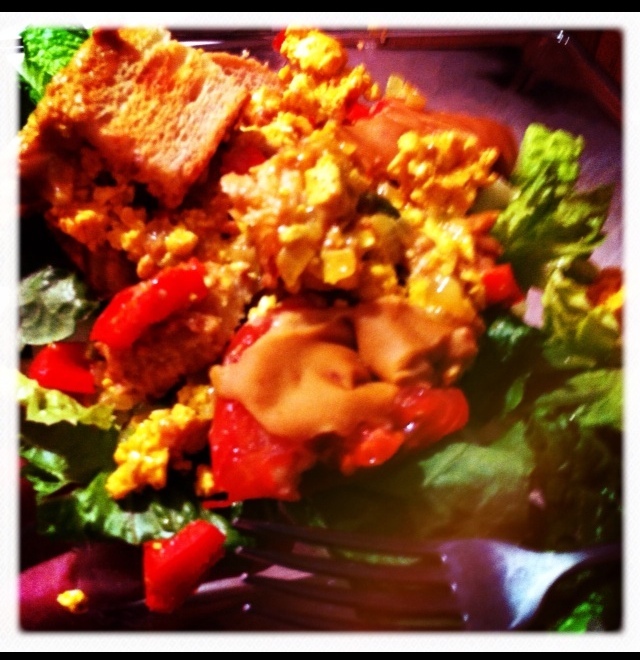 It turned out pretty well, becoming kinda like a baked tofu scramble on layers of breading and romaine. If you’re interested in messing with some recipes, we’re giving away a copy of “La Dolce Vegan! 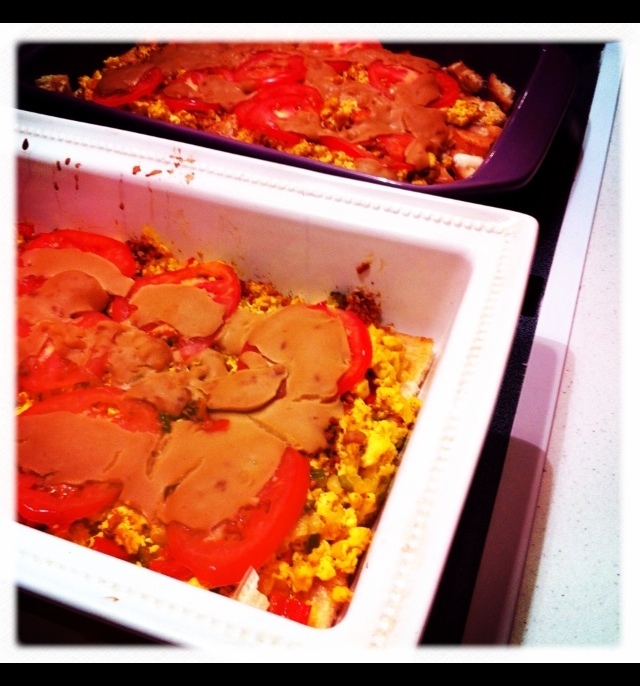 Vegan Living Made Easy” to one lucky DFV reader. Leave a comment below and we will choose person at random to receive this book. I think it looks yumalicious! I don’t have this one. I’ll have to check it out. Most of my cookbooks have been altered (Lea-i-fied), covered in writing with my own measurements, additions, and plain old cutting corners (we’re usually crunched for time). I had that book from the library ages ago, but had completely forgotten about it! Thanks for the giveaway.